The Battle of Cegar, Serbia occurred on May 1809. It pitted Serbian rebels commanded by Stevan Sindelic against the forces of the Ottoman Empire. Sindelic, realizing that his rebels would be overrun, and fearing extreme torture and eventual impalement upon capture, detonated his powder magazine as the Ottoman troops closed in. The blast killed all the rebels and many Ottoman soldiers. Vizar Hurshid Pasha subsequently beheaded the rebel bodies, removed the skin off the skulls and stuffed them for show, and finally had a tower built of the rebel skulls as a warning to the Serbians. 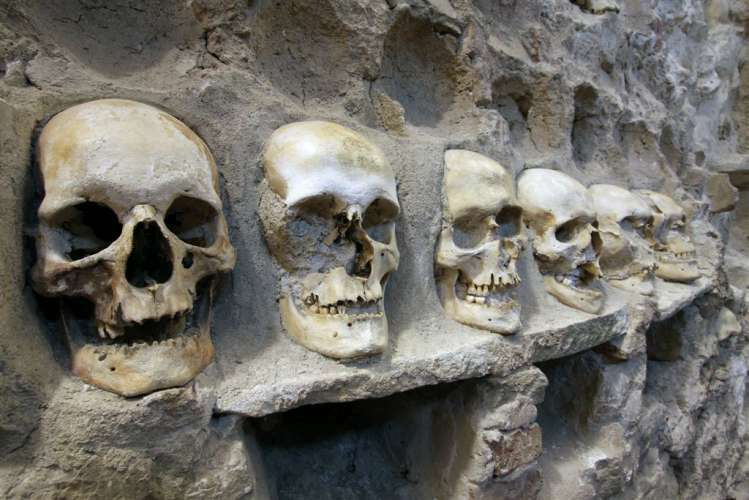 Skull Tower in Nis, Serbia originally held some 952 skulls. It is now a tourist attraction that is visited annually by some 30,000 to 50,000 people. Why is this significant at all? It turns out that the bizarre music played by the New Zealand mosque killer is a Serbian call to arms against Turkish Muslims and Croats. Some of the words he scrawled on the weapons he employed are the names (and dates) of individuals who fought historic Christian battles. There are phrases showing animosity to the recently signed Global Compact for Migration and its population replacement implications. It appears that the murderer, who is known to have toured Europe, was radicalized by what he saw happening as a result of uncontrolled and mass migration. Religious animosity and social disruption essentially drove him to extreme violence. The world media, of course, immediately jumped to the white nationalist conclusion, even convolutedly linking the killings to President Trump. This is bizarre reporting that hides important facts. The mosque killer’s preferred society is the current communist Chinese model. He extols socialist values and ecoterrorism. He hoped to provoke further dissension in American society. This murderous “nut” is more politically left than politically right. More eco-fascist in the ANTIFA mode than neo-NAZI. One of the more dangerous aspects of news media reporting is its distortion of world events. While 50 Muslims were killed at mosques in New Zealand, hundreds of Christians had been or were killed by Muslims in Nigeria. Where is the news reporting on the latter? It appears that reporters and their news organizations would rather create news from nice places like New Zealand than go into backward African nations and report on continuing genocide. One of the important questions is whether this substantial distortion of actual news is being done for propaganda and indoctrination purposes. A massacre is a massacre, and genocide is genocide. To emphasize the former and ignore the latter is bad reporting. It is certain to yield ever more bitterness because of the obvious injustice in the reporting. The New Zealand mosque murderer is an evil man, but he is not the only evil man in the world. All must be held to account for the results of their violent excesses regardless of the reason, religion, or ideology.